SCENE OF THE CRIME: UNC Finley Golf Course driving range, Chapel Hill, NC. 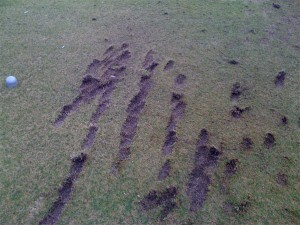 CHARGE: Desecrating golf grounds with inexplicably grotesque divot pattern. WEAPON: Not yet discovered. Search is on for a very muddy 5-iron or a trench shovel. NOTES: The location of the tee marker relative to the divot pattern, the rightward slanting direction of each individual divot, and the unnatural depth of each divot suggest that perpetrator is a left-handed golfer with a violent over-the-top move. Residents in homes on left side of driving range have been evacuated in case perp returns to hit more balls. Divot pattern somewhat resembles middle finger being given to greenskeeper. Greenskeeper has been relocated for his own safety. WARNING: This photo is for investigative purposes only. If you stare too long, you won’t be able to help imagine the golf swing that created this mess, and you will feel your handicap increasing as you do. Glance if you must, but avert your eyes quickly as if you were looking at the sun.